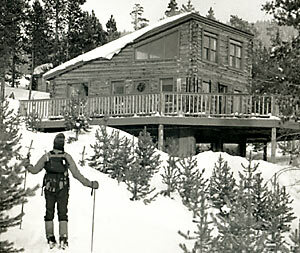 Vance's Cabin is located on a timbered mountainside near Tennessee Pass. Construction of the cabin began in 1981 and was completed in 1988. The hut is named in honor of one of the original owner's father Vance Faulkenberg, who was involved in building the cabin using timber from the site. Layout and capacity: 6 beds upstairs in a loft and 10 bunk beds downstairs in a communal sleeping area. Capacity 16. Dates Open: 4th Saturday in August through April 30th. The main winter route into Vance's Cabin follows a marked ski trail that begins at the base of Ski Cooper. It follows rolling terrain and gentle climbs into the hut. F.S. 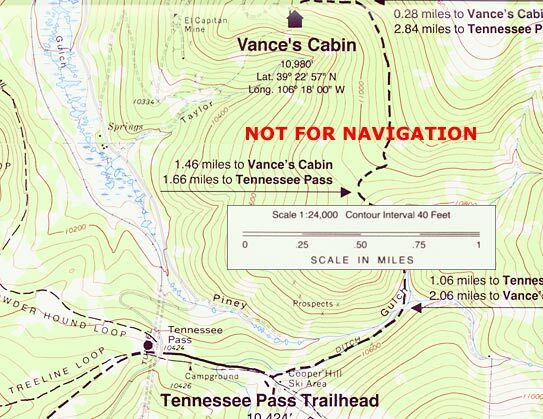 Road 731 is NOT a winter trailhead for Vance's Cabin. Any cars parked on F.S. 731 will be towed. Parking for Vance's Cabin at the Ski Cooper parking lot is only available at the official 10th Mountain parking area, which is marked by 10th Mountain Division Hut Parking signs. Vehicles parked in the middle of the general parking area are a significant problem for Ski Cooper when they plow the general parking area, and these vehicles may be towed. To hike into Vance's Cabin you can follow the winter ski trail or you can drive in on FS 731. Be aware that there is no parking along FS 731 and the only summer parking is at the closure gate approximately 1/4 mile from the hut. Vehicle access is never guaranteed to any hut at any time. For day hikes around Vance's you can head towards Chicago Ridge and explore the high alpine areas extended north and south along the ridge.